Ni hao from Shanghai! It is amazing the change that happens in a year. This year’s MWC Shanghai, like last year’s, took up about half of the Shanghai New International Expo Centre (SNIEC). “5G +” is the major theme and, unlike last year, 5G is not something in the distant future. It is now assumed to be in progress. The biggest of the pluses was AI, with a number of booths explicitly sporting 5G + AI signage. There were also 5G plus robots, cars, and cloud services. Many of those are really about AI as well. The show makes it feel like 5G is everywhere and will make everything better (or at least a lot faster). And Asia is leading the way. 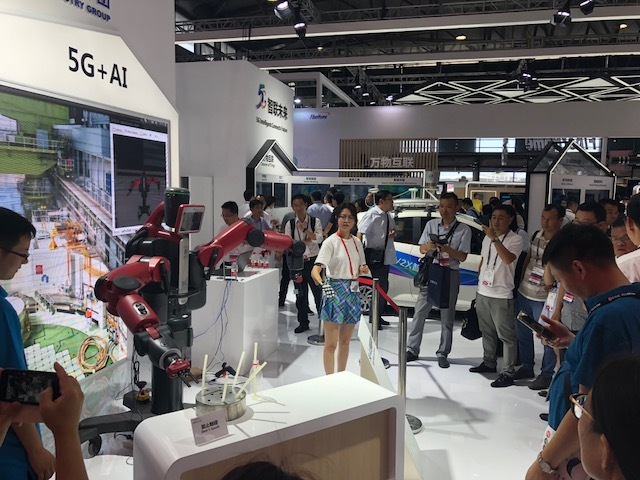 5G + robotics at MWCS 18. Most of the booths touted their 5G support as they did last year, but rather than talking about the future, they tried to say that their 5G was now. They claimed their products were in real-world tests with anticipated deployment schedules. 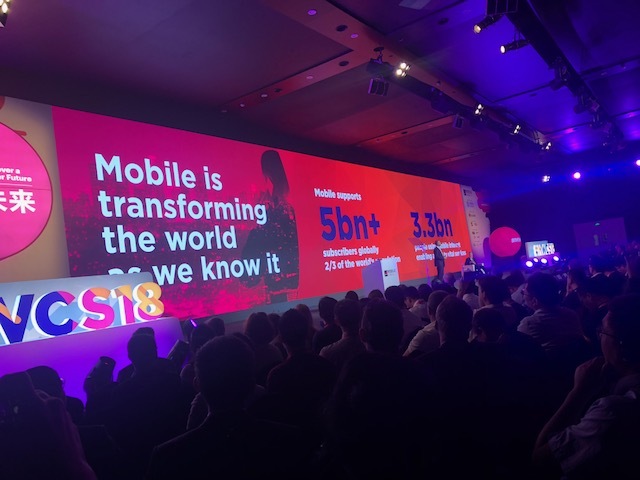 One of the keynote speakers talked about 1.2 billion 5G connections by 2025, with more than half of those in Asia. The purported scale and speed of the transition to 5G is staggering. The keynote stage, displaying some big numbers. The last two halls I visited showed that world is not all 5G and AI. These halls looked at current fun applications of mobile technologies and companies developing technologies in the near future. MWC allowed children into one of the halls, where they (and we adults) could fly drones and experience VR technology. I watched in some amusement as people crashed drones, rode bikes with VR gear to simulate horses, were 3D scanned, and generally tried out new tech that didn’t always work. The second hall included small booths from new companies working on future technologies that might be ready “4 years from now” (4YFN). These companies did not have much to show yet, but each booth displayed the company name and a short phrase summing up their future tech. That led to “Deepscent Labs is a smart scent data company,” ChineSpain is a “Marketplace of experiences for Chinese tourists in Spain,” and “Juice is a tech-based music contents startup that creates an ecosystem of music.” The mind boggles! The XPRTs’ foray into AI with AIXPRT seems well timed based on this show. Other areas from this show that may be worth considering for the XPRTs are 5G and the cloud. We would love to hear your thoughts on those areas. We know they are important, but do you need the XPRTs and their emphasis on real-world benchmarks and workloads in those areas? Drop us a line and let us know! Posted in 5G, AI, AIXPRT, AR, Augmented reality, Automated cars, Future of performance evaluation, IoT, Mobile data, Mobile devices, Mobile World Congress, Virtual reality and tagged 5G, AI, China, mobile, Mobile World Shanghai, MWC, Shanghai, VR | Bookmark the permalink. Follow comments with the RSS feed for this post.Post a Comment or leave a trackback: Trackback URL.